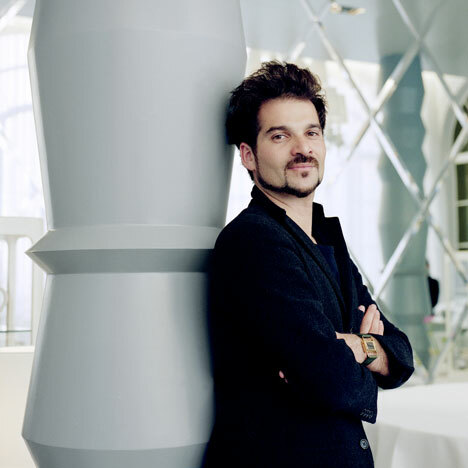 Jaime Hayon says brands should "ignore the market"
News: analysing trends and listening to what consumers want will ultimately result in bad design, says Spanish designer Jaime Hayón. "If I listen to the market, I'll be designing crap because many times it's good not taste, it's excessive," Jaime Hayón told Dezeen during an interview in Milan, where he is showing a new multi-purpose table for Republic of Fritz Hansen. He said that brands and designers should "ignore the market" and pursue quality rather than trying to please the masses. "If you start to analyse the market and try to think that you're going to be able to make the perfect sofa, forget it," he said. "Sometimes you get a brief with analytics, you can laugh at it." The exuberant tastes of consumers in the lucrative markets of Russia, Asia and the Middle East might to blame for some of the bad-quality products currently for sale, according to Hayón. "What people in Dubai, India, the Middle East and Russia want, is that what rules? Is that what [everyone] wants?" he asked. Hayón admits that convincing a company to disregard their customer's preferences is not an easy task, but thinks this is the only way to achieve the best results. "It's very hard to say that to a marketing director [of a brand] "ignore the market", but honestly it's the only way to get the glory of things, it's the only way to get results." He believes that brand owners should listen to, and trust, the designers they are working with and focus on the quality of the products. "The markets rule everything, the sizes, the periods, the options," he explained. "When an owner of a company says 'I don't want that anymore, what I want is to hear what the artists and the designer wants to say, in relation to what I feel about my own company', quality is a big word." Image courtesy of Hayón Studio.